Offering a comfortable stay in the heart of the city with traditional Turkish décor just 150 meters from Taksim Square. The air-conditioned 80 sqm apartment (1st floor) features 2 bedrooms with double beds and a living room with a single sofa bed, includes satellite TV (international and local channels are available), free Wi-Fi, and a well-equipped kitchen.The bathroom includes a shower and a washing machine. I support Istanbul card for public transportation, drinkable water,detergent for washing machine and the dishwasher, soap for free. Also i am renting Turkish mobile simcard (inclueding 2 gb data connection) for 10 Euros. Istanbul International Airports' bus stop(Havatas Shuttle Bus) is just 5 minutes walk away from the flat. Taksim Square offers excellent transport connections (metro, tram, bus) to the historic Sultanahmet District (Blue Mosque, Hagia Sophia, Topkapi Palace). The buliding is situated in the old centre of Pera with its art galleries and small traditional bars and restaurants. The flat is just two minutes far from Istiklal Street, the main shopping and pedestrian avenue of Istanbul, and 150 meters from Taksim Square, and close to the old European embassies: The Palais de France, The Palazzo di Venezia, The old Dutch and Russian Embassies and the Greek Consulate. There is a Metro stop about 100 meters from the flat leading very fast to Sultanahmet (the area with Hagia Sophia, the Blue Mosque and the Grand Bazaar). For more tips and information, please feel free to send me a message. Hello everybody.I am 33 years old. Actually I started to rent my flats on the 2007 and one of the first person who started to do this business in Istanbul. I like what I do, I like meeting new people, I like to show my city Istanbul to the guests coming to Istanbul. And than I found a small company and stated to do airport transfer services. I like reading books, listening music. You can ask me any information about the city related to your vacation to make your vacation more comfortable. Thanks for reading my profile. Have a good day. It’s in a very bad area. Smells very bad. Folcse adventuring & misleads stay away. As we arrived in the area I realized It’s in a very bad area. The owner was waiting for us so I asked to see the space. That’s when I realized it’s not a healthy place. Smells very bad & bathroom so old. Folcse adventuring & misleads stay away. you rented old style apartment and waiting for modern apartment? Apartment is same with pictures and not not smells like you said. I think when you write this review you were thinking about lost money. For potential guests, he came with 2 cars, i think he is rich Arab family and they want modern place. He just look the place for a second and he said doesn't want to stay and i said ok. Place were not smell. I think driver said them area is not good and dangerous (some drivers are making this cause when they find place they are taking good commission) I didn't make refund cause he came negative already. And he booked the flat long time ago. 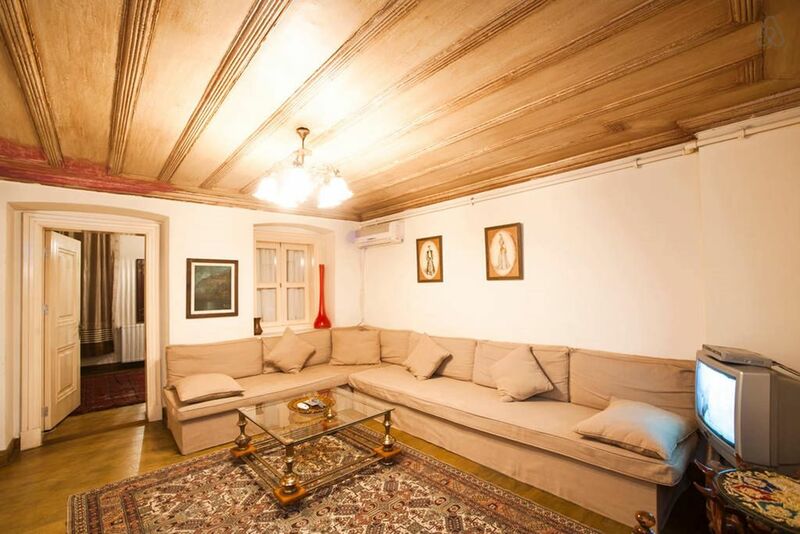 Appartement très bien placé dans le quartier Taksim. Quartier bruyant mais très animé & agréable. Appartement conforme à la description et propre. "we had a really nice stay. everything was fine, Mr C. is kind and he also organised our transfer to the airport which was very convenient according to all the luggages we had." "Taksim Apt 2. Exactly as advertised. Clean, pleasant and comfortable premises regularly attended to. All necessities available and in v. good condition. Great care and professional service given. Quiet neighbourhood close to central transport servicing all areas, major attractions and otherwise. Very, very happy. Round the corner from famous Istiklal promenade. Highly recommended." A selection of shops, cafes, bars and restaurants can be found in the immediate area, especially surrounding the famous shopping street, Istiklal Avenue. Taksim Square is a cultural meeting point, lively and fun both day and night. For Ataturk International Airport, Havatas Airport Shuttle Bus is just a 5-minute walk away. Taksim Square offers excellent transport connections (metro, tram, bus) to the historic Sultanahmet District (Blue Mosque, Hagia Sophia, Topkapi Palace).